It’s nice to know that your watch has been the gold standard for excellence for over 100 years. It’s even nicer, when it’s made of solid 18K gold. 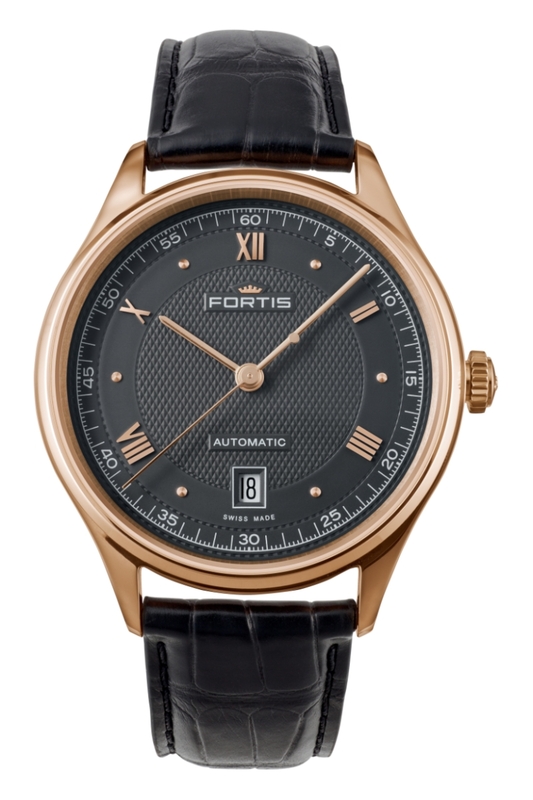 Fortis timepieces have always been as good as gold in the eyes of watch aficionados. Now the brand that continues to set the gold standard for technical excellence is being produced in solid gold. 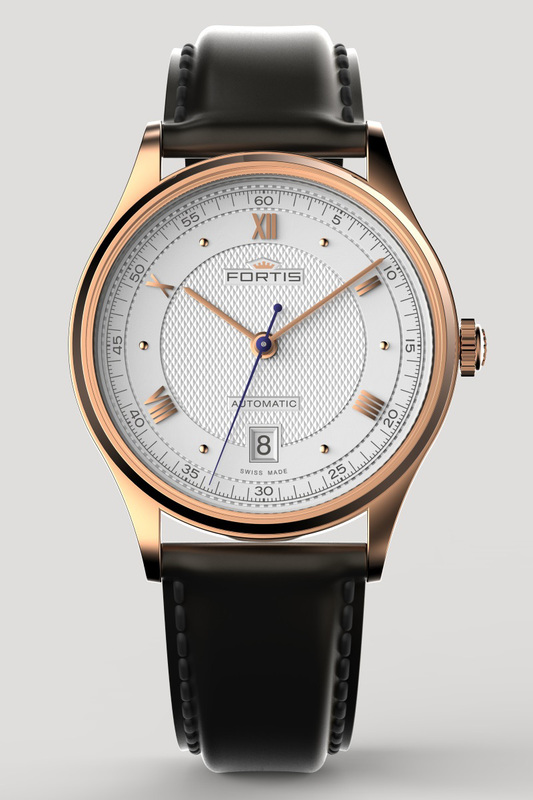 For the first time ever, four of the most innovative and exciting new Fortis collections are being produced in 18K rose-gold editions. Anyone who has admired the superb craftsmanship and technical excellence of Fortis can now wear a beautifully crafted, solid gold 19Fortis, Orchestra, Tycoon, or Hedonist timepiece. Each of these exclusive gentlemen’s timepieces is part of the newly introduced Fortis Terrestis Collection, which celebrates the iconic Fortis designs of the 30’s, 40’s, and 50’s. 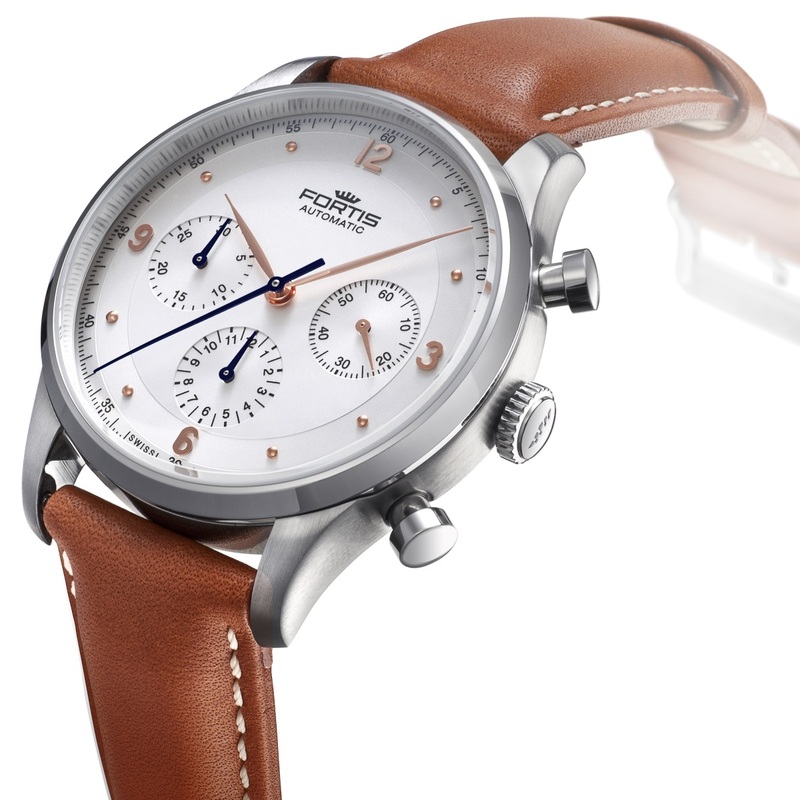 By combining classic styling with state-of-the-art technology, the Terrestis Collection celebrates a unique 100-year heritage, while maintaining the Fortis tradition of craftsmanship and innovation. These classically elegant men’s timepieces never go out of style and will be proudly passed down from one generation to the next. It is only fitting that they are now available in 18K solid gold. 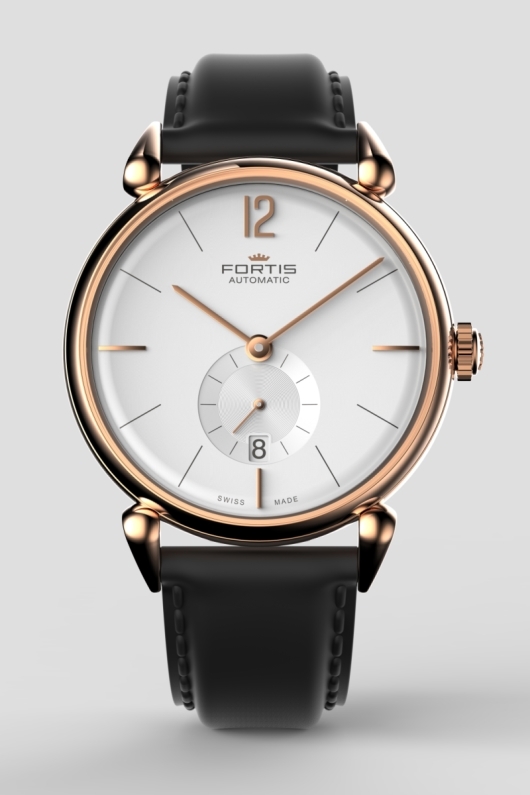 The understated elegance of the 40 mm 19Fortis is accentuated by the newly available 18K rose-gold case. This sophisticated three-hand configuration is perfect for black tie, white, tie, or no tie occasions. With classic baton style hands, raised Roman numbers, and an intricate textured pleated dial, this dress timepiece is the perfect companion for any important occasion. With its art-deco inspired droplet style lugs and classic free running small seconds display, the aptly named Orchestra is a symphony of sophisticated elements. 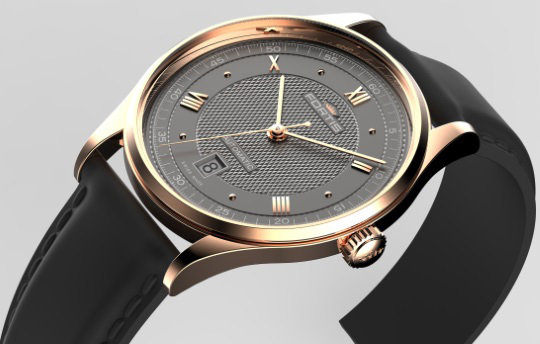 The small seconds display, featuring an engraved pattern of concentric circles, has been recessed in a gently domed dial, adding a multi-layered look to the inspired design. With a single understated Arabic number at twelve o’clock, and three raised bar indices at 3, 6, and 9 o’clock, this debonair watch was destined to be encased in 18K solid gold. 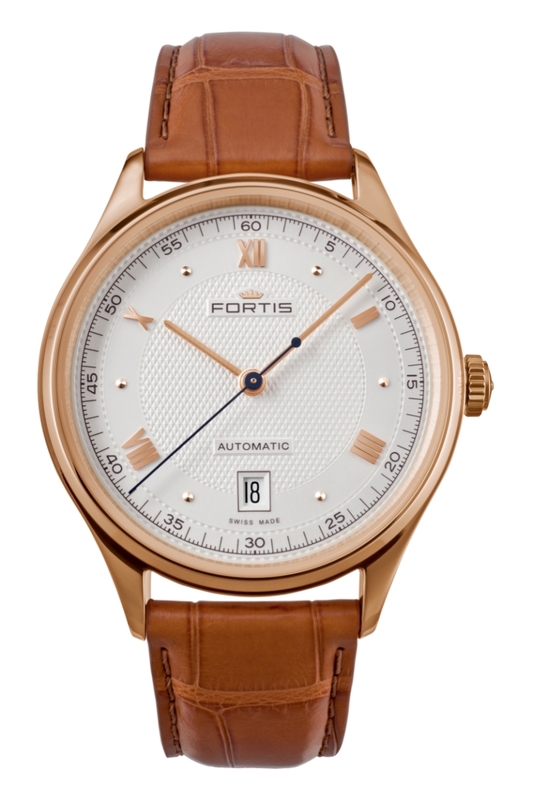 The solid gold 41 mm Tycoon combines state-of-the-art technology with a reverence for early Fortis innovations. This superb gentlemen’s timepiece is available in chronograph and three hand configurations that make a bold statement on the wrist of any modern day tycoon. With its historically correct domed sapphire crystal, raised dot indices, and feuille style hands, this watch imparts a confident air of success to any man’s wrist. If you are fond of vintage styling, but prefer today’s larger sizes, the classically inspired Hedonist is the watch for you. With its slim bezel and beautifully minimal dial, this 40 mm men’s timepiece shares a respect for the past, while remaining true to today’s latest fashion trends. Featuring a minimal anthracite or silver-opaline dial adorned with crisp Arabic numbers alternating with raised dot indices, this opulent 18K gold timepiece evokes the minimal elegance of the Bauhaus era. 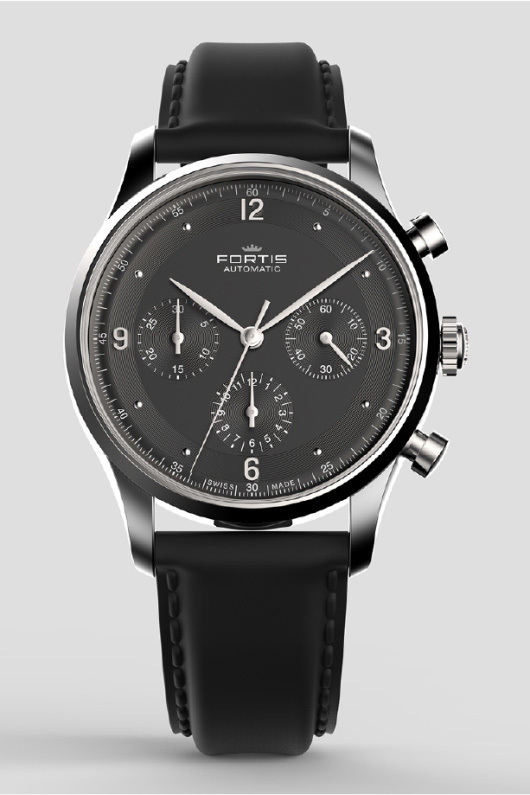 Fortis Tycoon Chronograph a.m. Fortis Hedonist a.m.
Fortis fans already know that their favorite timepieces set the gold standard for fine craftsmanship and technical excellence. 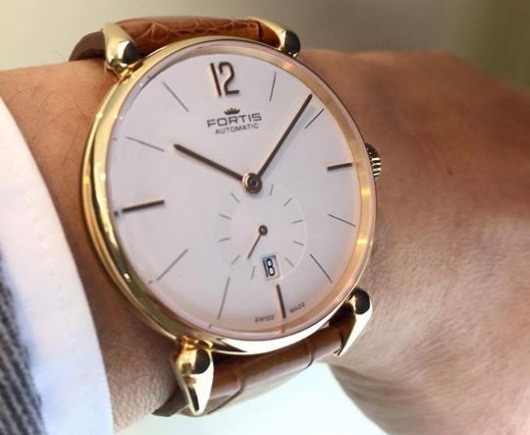 Now, they have a unique opportunity to put a 19Fortis, Orchestras, Tycoon, or Hedonist that has been masterfully crafted in 18K solid rose gold on their wrist. If you’re a Fortis fan with the Midas touch, contact an authorized Fortis watch dealer immediately and ask to see these exquisite new solid gold editions. If you thought that Fortis only made tool watches, the new Terrestis Collection will remind you of a time when Fortis made milestones. Many of you know Fortis as the watchmaker who produces some of the world’s best aviator and space watches. 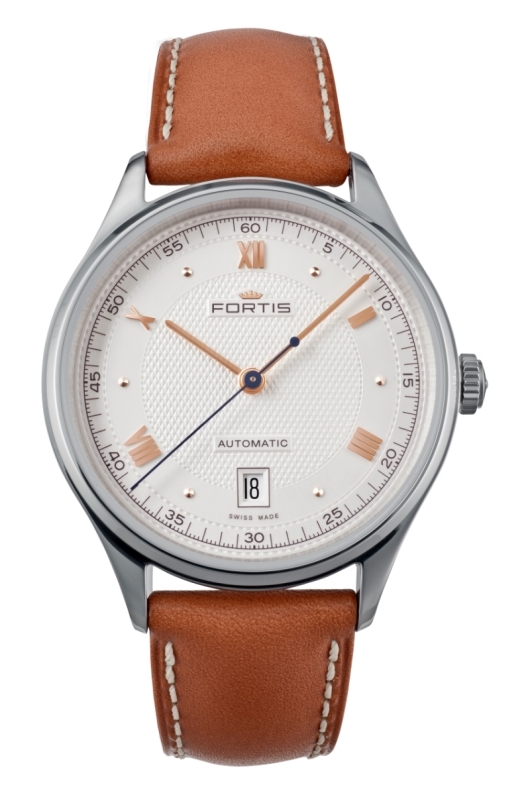 What many forget is that Fortis gained their reputation as a manufacturer of superlative tool watches by astounding the world with a long series of horological milestones back in the 1930’s and 40’s. In fact, as far back as 1926 Fortis amazed the world with the first practical self-winding automatic watch movement. They brought some of the first waterproof watches to the world with their popular Fortissimo models. These pioneers of the watchmaking art continued to innovate throughout the 1930’s and 40’s, bringing their technical expertise and classic style to a succession of groundbreaking timepieces. 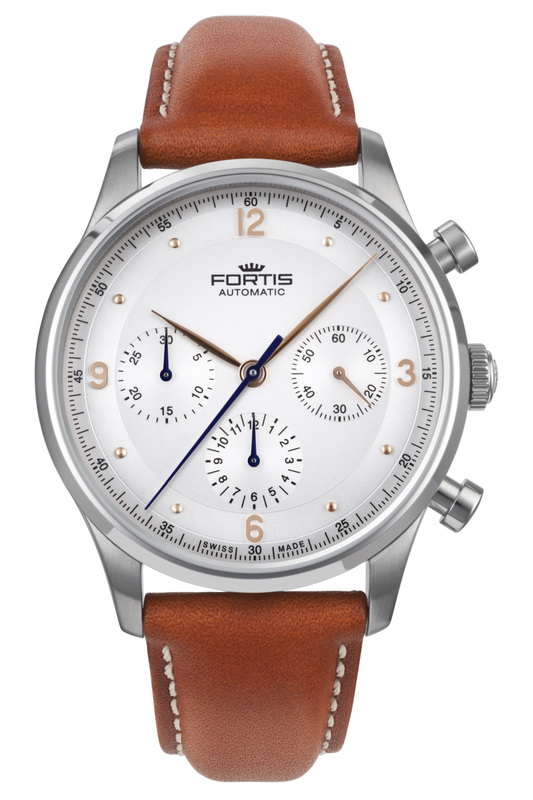 Fortis pays homage to these iconic masterpieces with their new Terrestis Collection. 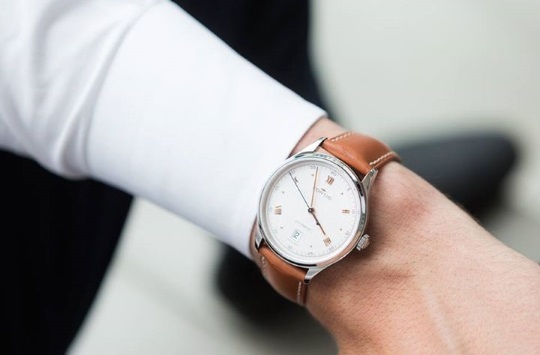 Inspired by popular Fortis timepieces from the golden age of watchmaking, the Terrestis Collection combines classic style with state-of-the-art technology. 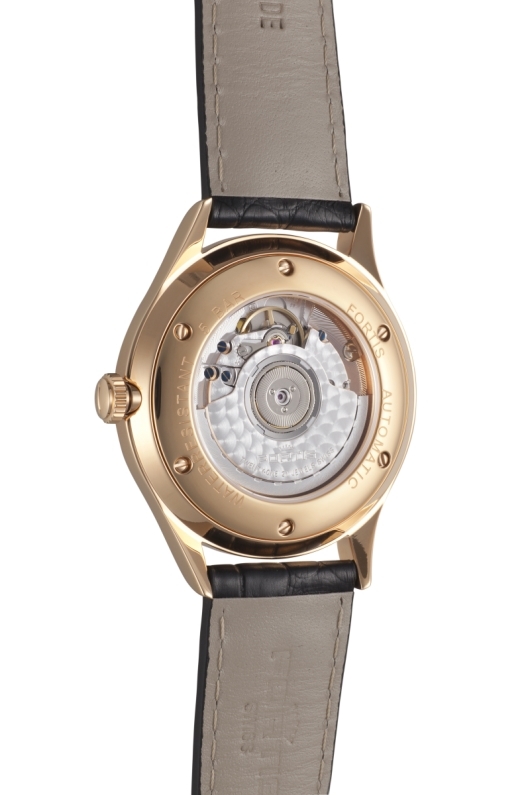 Exceptional Fortis movements are housed in slim new cases. The classic dials are protected with period-correct domed sapphire crystals. 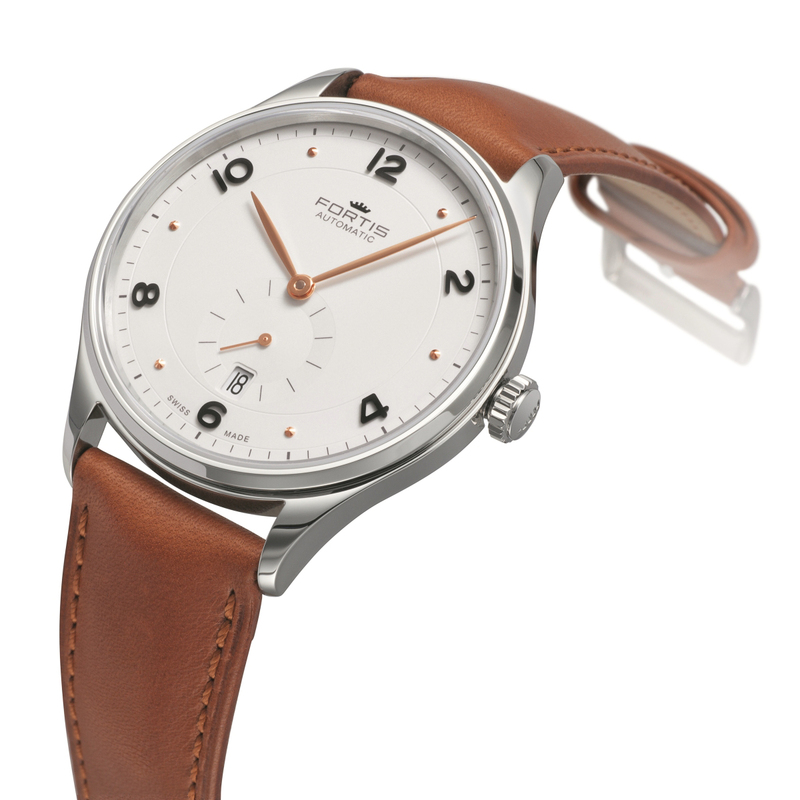 Many models feature authentic 1940’s Feuille hands, and some have observation style case backs that are bolted on using eight stainless steel screws. Each member of this impressive collection is a genuine work of art. The flagship of the Terrestis Collection is the impressive Tycoon Chronograph. This impressive watch pays homage to the groundbreaking Valjoux 72 manual-winding chronograph initially introduced by Fortis in 1942. The Tycoon Chronograph combines authentic 1940’s styling with a modern 41 mm case and a state-of-the-art 47-Jewel Swiss made DD2020 automatic movement. Featuring period correct feuille hands, a blued sweep second hand, a bolt on observation caseback, and raised rose gold plated numbers and indices, this magnificent timepiece represents the Fortis heritage at its very best. The Terrestis Tycoon a.m. and p.m. continue the understated, elegant style of the flagship Tycoon Chronograph in an inspired three-hand configuration. The Tycoon a.m. and p.m. models share the Chronograph’s large 41 mm case, screw down observation caseback, domed sapphire crystal and authentic feuille hands. You have a choice of silver-opaline or anthracite black dials, each with a convenient date window at 6 o’clock. A Swiss made 21-Jewel, ETA 2892-2 automatic movement with a 42-hour power reserve, powers the Tycoon a.m and p.m. The slim stainless steel case is water resistant to 167 feet and like all Fortis timepieces; this Tycoon carries a two-year manufacturer’s warranty. 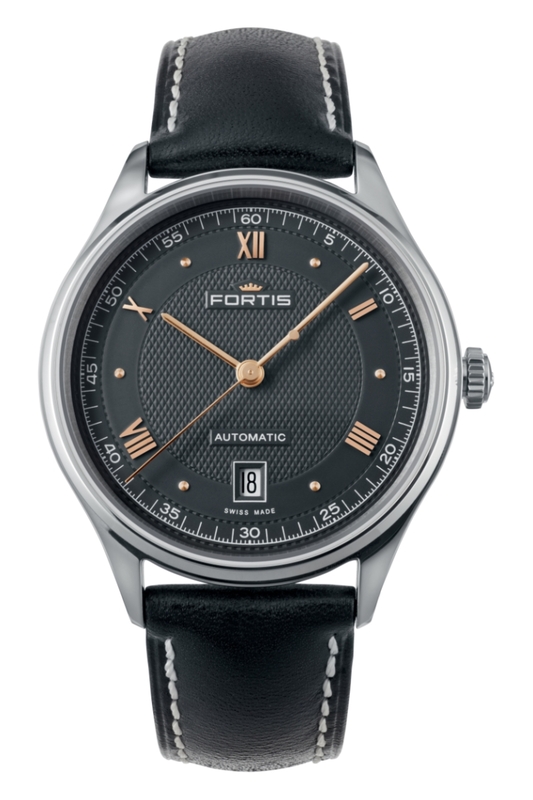 The distinguished looking 19Fortis a.m. and p.m. bring a more formal look to the Terrestis Collection. With a slightly smaller 40 mm case and an intricate and sophisticated patterned dial, the 19Fortis a.m. and p.m. are an inspired tribute to the elegant Fortis timepieces of the 1930’s and 40’s. The silver-opaline a.m. model and the anthracite p.m. model both feature a precise checked pattern in the center of the dial, surrounded by raised metallic Roman numbers and a precisely inscribed minute track. There is also a convenient date window at 6 o’clock. These exceptional timepieces are powered by a Swiss made 21-Jewel, ETA 2892-2 automatic movement and equipped with period correct rose gold plated pencil hands. For those who want the utmost in retro-inspired elegance, the 19Fortis a.m. and p.m. are also available with a solid 5N rose gold case. A free running small seconds sub-dial at 6 o’clock was one of the most characteristic features of fine timepieces from the 1930’s and 40’s. The superb Hedonist a.m. and p.m. models pay homage to this familiar style, adding a beautifully embossed dial and authentic feuille hands. Fortis 901.20.12 Hedonist a.m. Fortis 901.20.11 Hedonist p.m. The beautiful Orchestra a.m. and p.m. represent art-deco elegance at its very best. These period correct Fortis masterpieces feature dressy stylized lugs, a minimal dial with three raised bar indices, and a single raised Arabic number at 12 o’clock. The small seconds sub-dial at 6 o’clock has been debossed for a sophisticated 3-D effect and includes a convenient date window. With its elegant rose gold plated pencil hands and luxurious padded topstitched leather band, the exquisitely styled Orchestra is the perfect timepiece for a night out on the town. Like the Terrestis Hedonist, the Orchestra is also available in a solid 5N rose gold edition. π (or Pi), the mathematical constant representing the ratio of a circle’s circumference to its diameter, is one of the most famous numbers in history. Since most wristwatches are circular, renowned artist and designer Rolf Sachs thought a watch face was the perfect place to explain and honor this famous and extremely important number. 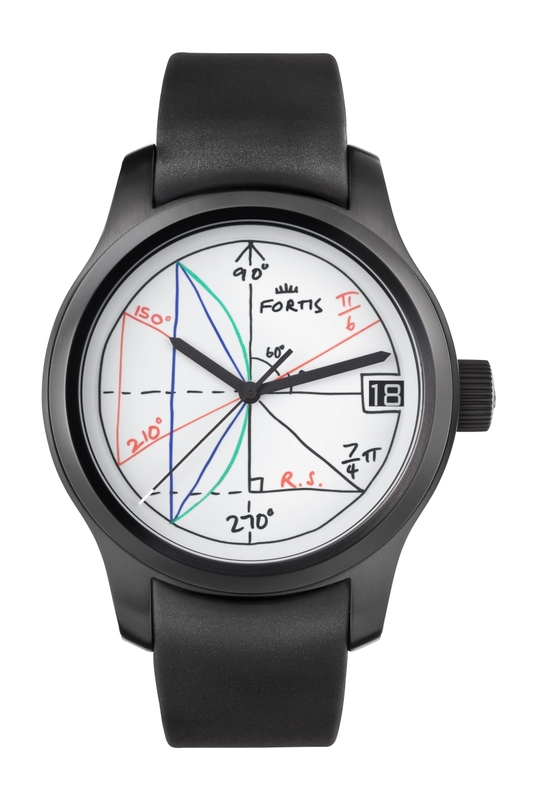 Produced in an extremely limited edition of only 150 pieces worldwide, the Terrestis 2π is a wearable work of art. Featuring a white Superluminova dial inscribed with Sachs’ unique interpretation of Pi, this whimsical 42 mm three-hand configuration is a delight to wear. A 25-Jewel Swiss made F-2014 automatic movement with a 38-hour power reserve powers this artistic tribute to mathematics. An anti-reflective scratch resistant sapphire crystal protects the colorful dial while a second sapphire crystal on the back allows you to observe the precision Swiss made movement at work. The impressive 2π is water resistant to 669 feet and can be equipped with your choice of a leather performance strap, leather dress strap, comfortable caoutchouc band, or black PVD coated stainless steel bracelet. Like all Fortis timepieces, Terrestis models are engineered to last a lifetime and carry a two-year manufacturer’s warranty. 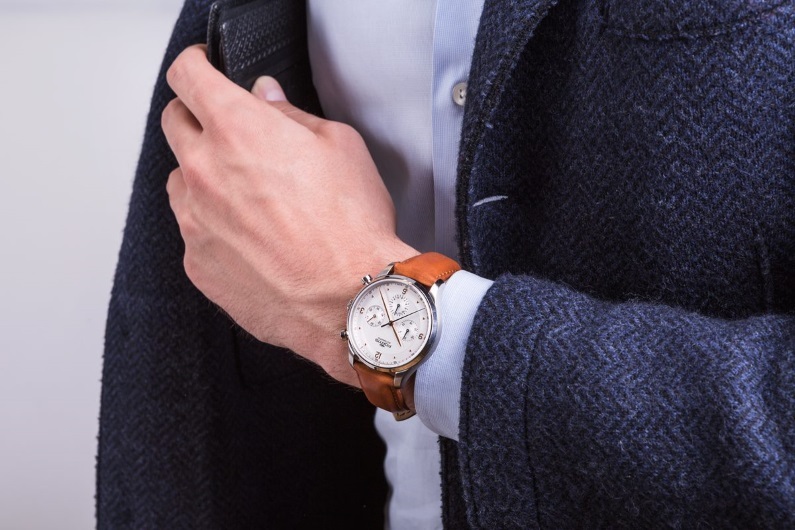 If you’re fond of the iconic and historically significant watch styles from the 1930’s and 40’s, you’re going to love the Fortis Terrestis Collection. Each of these amazing timepieces is a testament to the craftsmanship and fine design that true watch connoisseurs have grown to depend on for over 100 years. 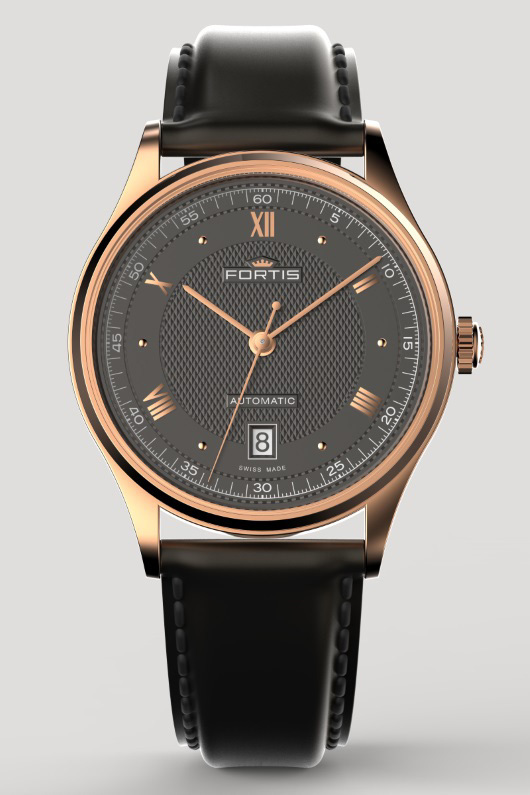 To see how these exceptional timepieces looks like on your wrist, contact an authorized Fortis dealer immediately and ask to see the entire Terrestis Collection. 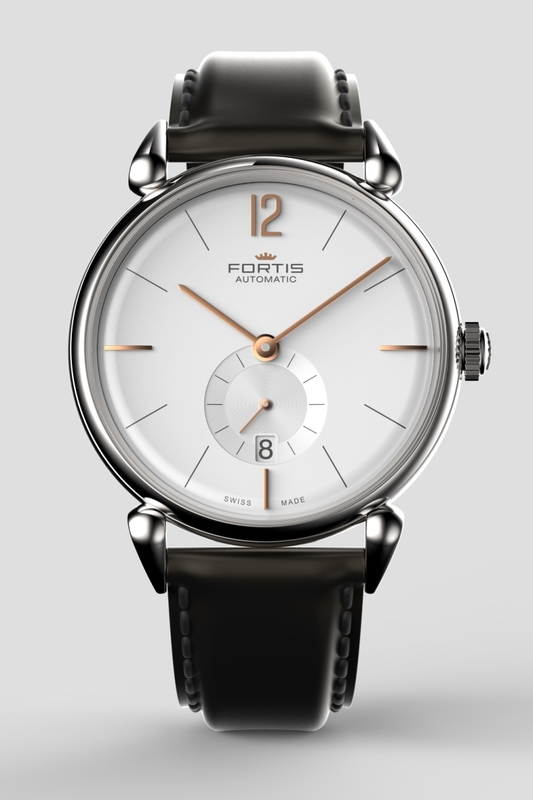 After more than a century of watchmaking, Fortis can cite several years in its history that are significant to the establishment of its reputation as a leader in the design of fine timepieces. Years like 1943, when Fortis introduced the water resistant Fortissimo; or 1987, the year Fortis launched its trend-setting Fortis Flieger Chronograph; and 1994, when a Fortis watch made its first orbit around the earth aboard the MIR space station. 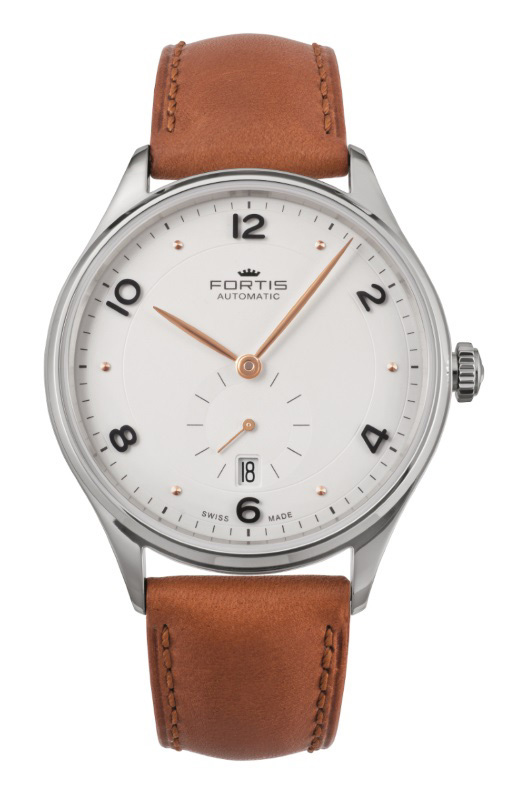 Fortis introduced its newest collection – Terrestis – in Basel earlier this year, and in doing so added 2015 as another watershed year in the brand’s history. 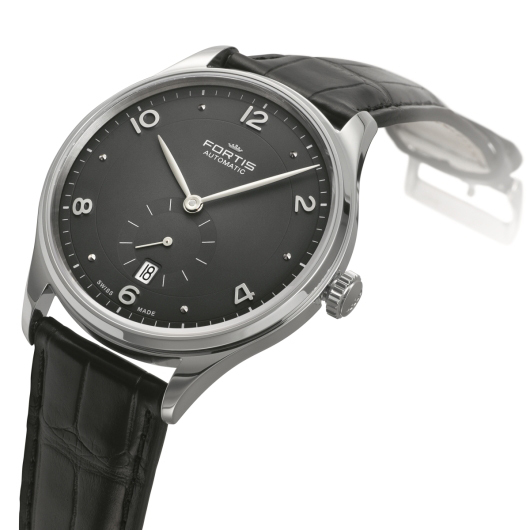 Within the Terrestis collection, watches like the 19Fortis series pay homage to vintage designs of the 1900s, especially the ’30s and ’40s, and fill a previously vacant niche in the brand’s lineup. 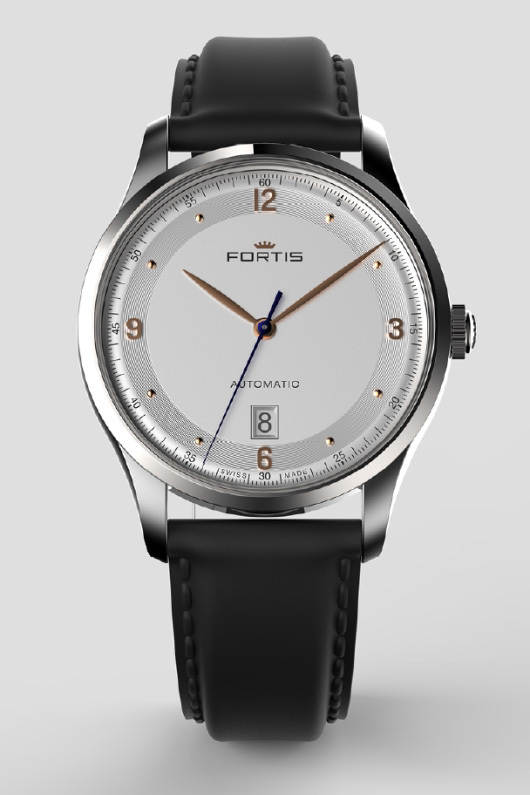 The 19Fortis is a sophisticated dress watch for the cosmopolitan adventurer – the kind of suave gent who spends his time negotiating the rhythms of fast-paced modern life. 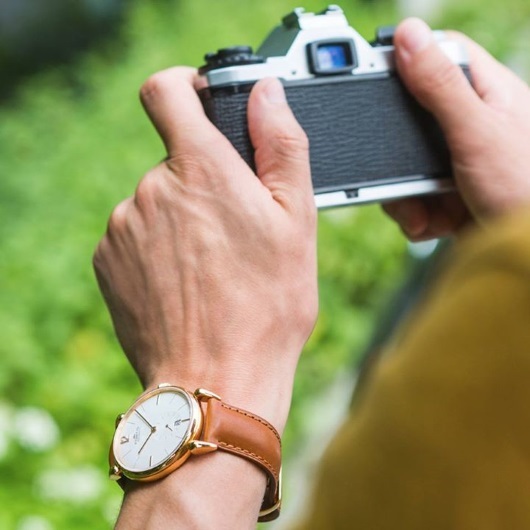 The design is part nostalgia and part opulence, beginning with a straightforward case that aims to highlight the dial with its thin polished bezel and discreet curved lugs. At 40 mm in diameter and 8 mm in height, it’s designed to have a low profile and slide comfortably under a shirt cuff. And the case is available in one of two metals: polished stainless steel or solid 5N rose gold. There are two dial variants for each metal: an “a.m.” version of silver-opaline and a “p.m.” version of anthracite, the first representing day (light) and the latter representing night (dark). Aside from the a.m. versus p.m. background coloration, the dials of all four 19Fortis models are almost identical. The pattern at the center of the dial is described as “pleated texturing,” meant to convey the qualities of a perfectly “pressed tuxedo shirt,” which speaks to the watch’s place among gentlemen. 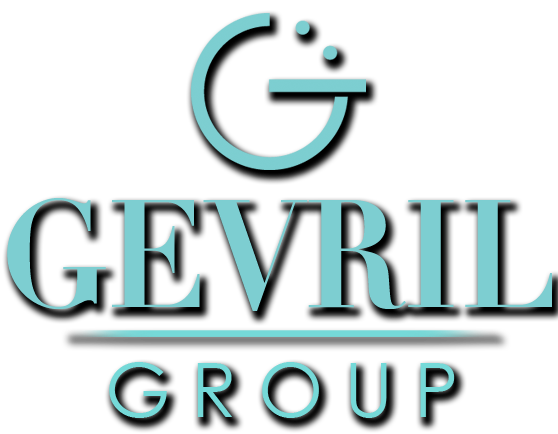 Moving outward, applied rose-gold-coated Roman numerals at 12, 2, 4, 8 and 10 o’clock are interspersed with similarly coated dot hour markers. A small minute-and-second track at the outside of the dial features Arabic numbers at five-minute increments, in pleasant contrast to the large and sparsely populated Romans. The watch’s baton-style hour and minute hands are also coated with 5N rose gold, with the hour hand reaching just to the outer edge of the central pleated pattern and the minute hand extending further to the minute-and-second track. The silver-opaline dial version features one significant difference – a blued sweeping seconds hand, another nod to traditional watchmaking and a striking focal point. 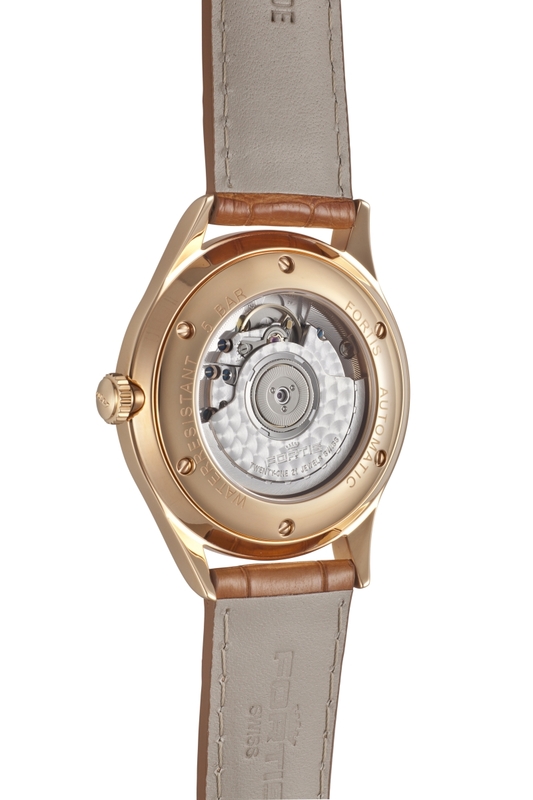 Models with anthracite dials have a rose-gold-coated seconds hand instead. The 19Fortis features a single complication – the date – aptly framed in a tidy window at 6 o’clock. 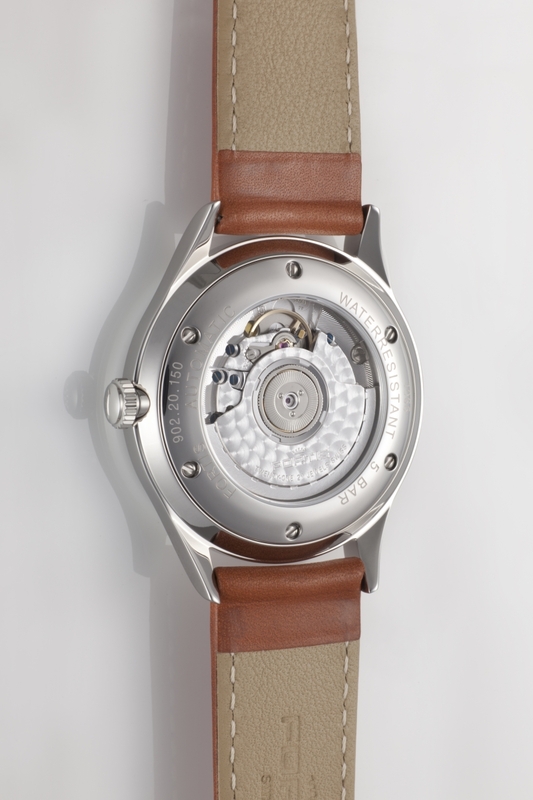 More blued steel is visible through the window on the caseback, where the blued screws of the Swiss made ETA 2892-A2 automatic movement appear. 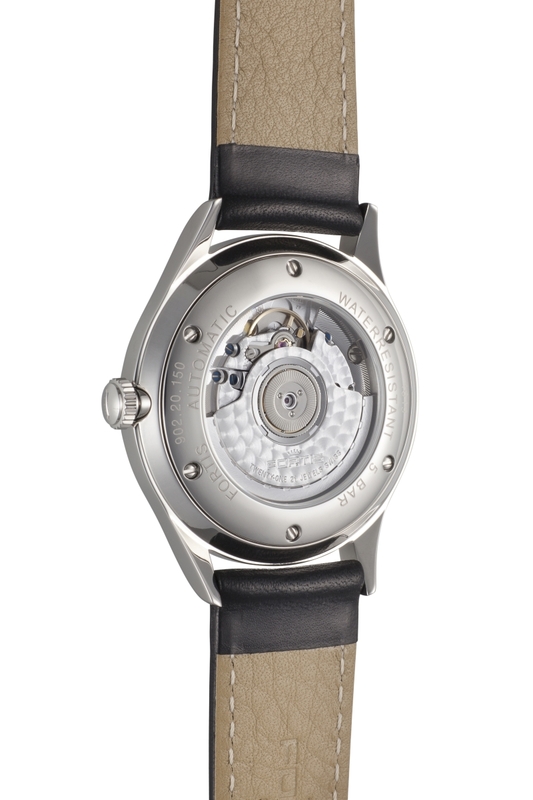 The winding rotor is engraved with the Fortis emblem and features perlage circular graining to match the bridges below. The caseback employs six screws to fasten it to the front of the case. 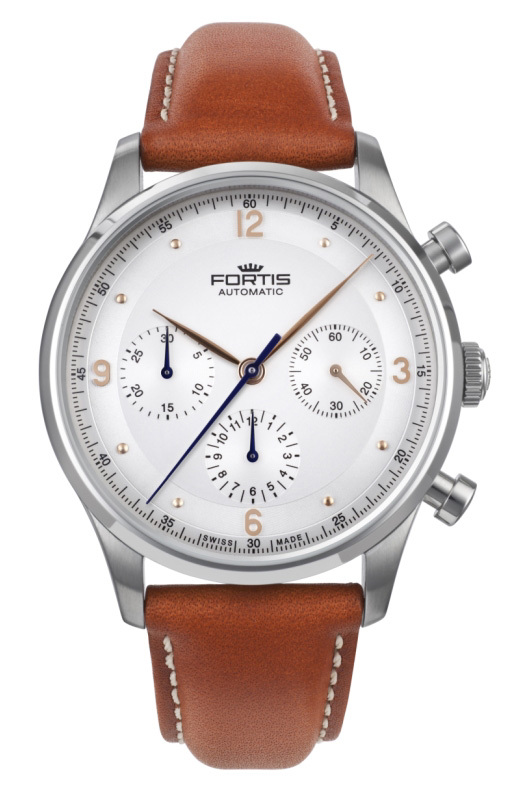 19Fortis watches are paired with one of two strap styles, dressy alligator-patterned leather with matching parallel stitching or more casual grained leather with white parallel stitching. Each strap is available in black or brown and all of them have tang buckles in either stainless steel or rose gold to match the case. The symmetrical design of the 19Fortis is an example of refined, harmonious arrangement, and it proves once again that Fortis sees no boundaries in its ability to build watches for all aspects of modern life. Every 19Fortis watch is packaged in a leather box and comes with the Fortis international warranty. 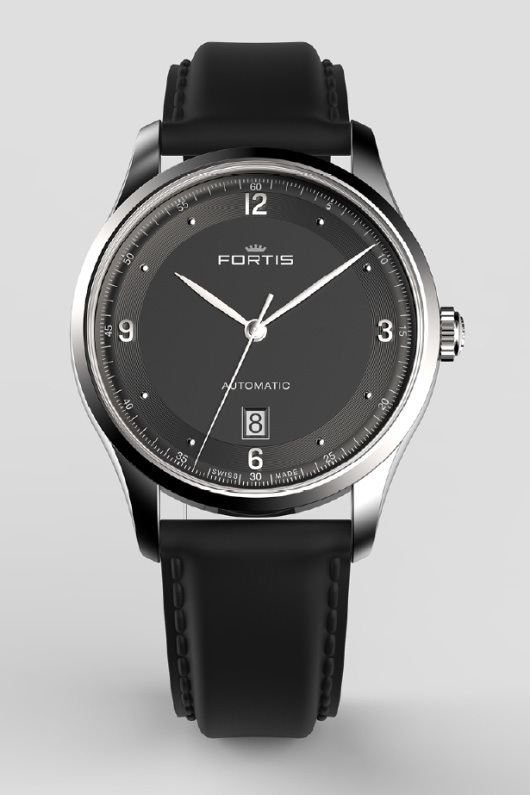 Contact an authorized Fortis dealer today to explore the 19Fortis and the entire 2015 Terrestis collection. Both classically inspired Fortis timepieces have their roots in the elegance of the 1930’s but are as different as night and day. The beautiful new Fortis Hedonist Collection is a tribute to the iconic timepieces from the 1930’s that made the Fortis brand world famous. There’s nothing old fashioned about the Hedonist though. These big, bold 40 mm stainless steel timepieces have a clean simplicity that pays respect to the past while remaining true to today’s latest fashion trends. The minimalist three-hand configuration features a traditional free running small seconds dial at 6 o’clock, accented with classic feuille hands, raised dot indices, raised applied Arabic numbers, and a convenient date window at 6 o’clock. 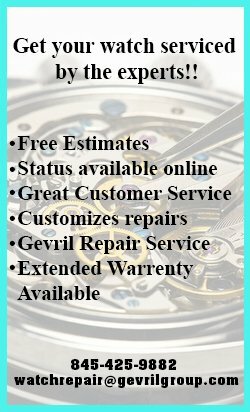 An anti-reflective, scratch resistant sapphire crystal protects the beautiful dial, while a mineral glass caseback secured by six screws lets you observe the intricacies of the precision Swiss made 27-jewel ETA 2895-2 automatic movement within. 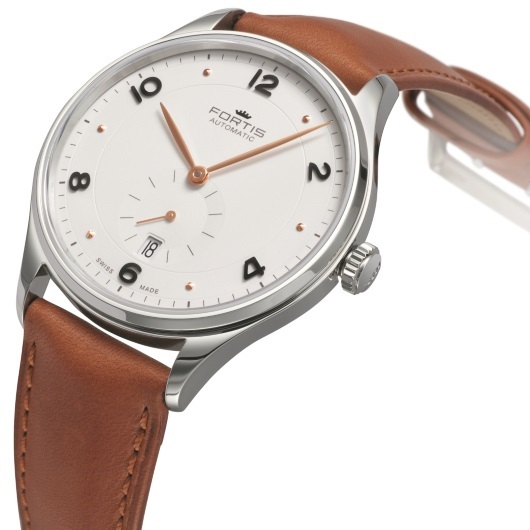 There are two models of the Fortis Hedonist available. The Fortis Hedonist a.m. features a silver-opaline dial with raised black numbers and rose-gold plated hands and indices. 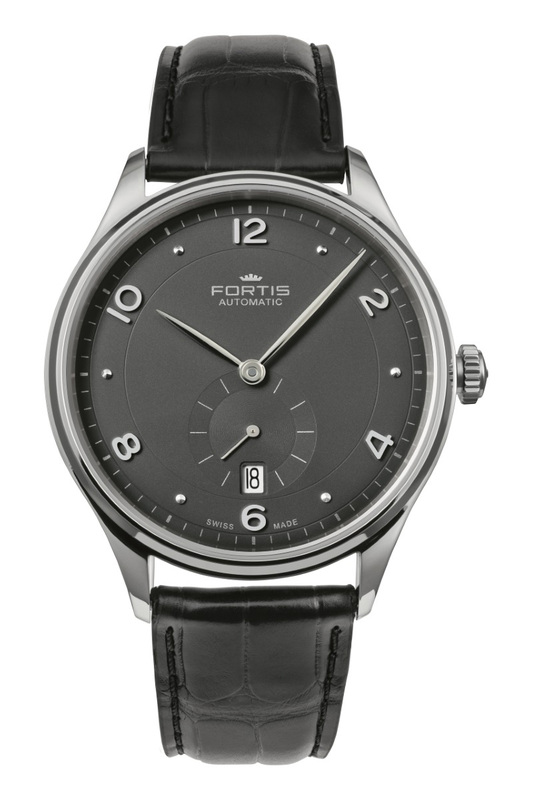 The Fortis Hedonist p.m. features an anthracite dial with rhodium coated hands and numbers. Each of these fine timepieces has their own personality, so you may want to acquire both. Hedonist timepieces have a 42-hour power reserve and are water resistant to 167 feet. They can be equipped with your choice of a premium black, medium brown, or light brown leather strap and come in a luxurious leather presentation case. 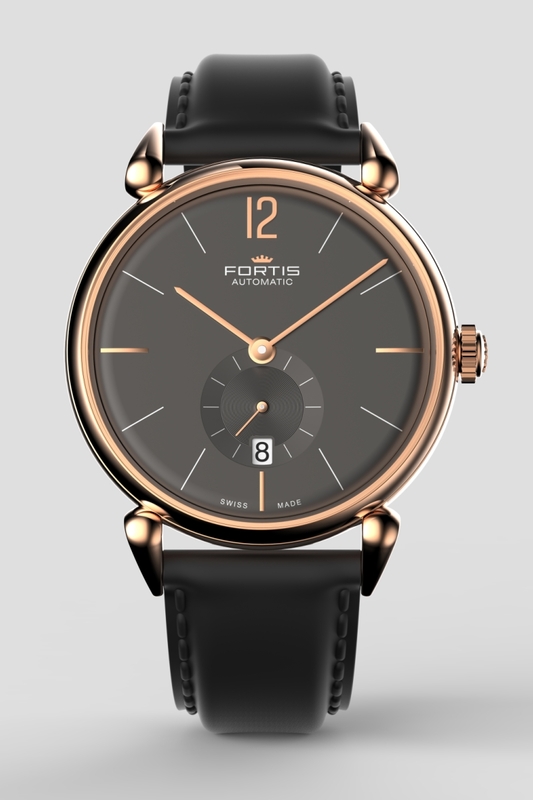 Like all Fortis timepieces, the Hedonist is protected by a two-year manufacturer’s warranty. If you’re fond of vintage styling, but prefer today’s larger sizes and modern reliable movements, then the fashionable Hedonist is the perfect watch for you. If you’re a hedonist, or would like to become one, you need one of these superb timepieces on your wrist. To reserve your own Hedonist, contact an authorized Fortis dealer today and ask to see the entire Hedonist Collection.